Custom designed and developed plastic tubing and plastic profiles. Made to your exact specifications. At PETRO, we don’t just claim to be plastic extrusion specialists, we work to earn that reputation every day. Over the past forty years, we’ve made major and meaningful advances in plastic extrusion. We introduced NylaGlide™ GR channels, creating 15 distinct shapes, developed SOLEF® PVDF tubing in 11 stock sizes and introduced a full stock line of Acrylic Profiles for applications such as Point of Purchase (POP) displays. PETRO is continually striving to be the number one source for your plastic needs. Our vast inventory of stock products suits many of our customers but our custom manufacturing capabilities allow us to satisfy any requirement. Our custom services are second to none with such capabilities as in-line cutting, tape application, coiling, angle cutting and customized lengths. Petro offers 5 Stock Plastic Profile Shape lines, including our Nyla-Glide GR ™ , mds-filled Nylon 6 channel line, which has over 15 stock C & U shape channels, for various wear and edge trim applications. Petro Extrusion Tech., Inc (PET) offers 8 stock product lines, in addition to it’s vast Custom Plastic Extrusion capabilities. 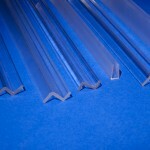 We offer 3 lines of Stock Plastic Extruded Tubing, and 5 lines of Stock Plastic Product Shapes. 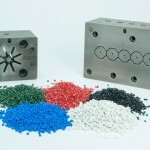 We extrude most thermoplastic materials into custom plastic profiles, on an ‘as specified’ basis, developing tooling and product to the customer’s specifications. Specialty cut lengths, including angle-cutting, custom color, post-extrusion fabrication, and tape application are all included as part of our custom capabilities. We extrude using a wide variety of thermoplastic resins available on the market today, including Polycarbonate, Nylon, Acrylic, PE, PP, ABS, PVC, TPR, Kraton™ , Urethanes, as well as many others.